3DCS Variation Analyst for NX Software is used by manufacturers across the globe for Tolerance Analysis to reduce scrap, rework and warranty claims. 3DCS Variation Analyst is used by the world's leading manufacturing OEM's to reduce their cost of quality. By controlling variation and optimizing designs to account for inherent process and part variation, engineers reduce non-conformance, scrap, rework and warranty costs. The Leading Variation Analysis Solution - What is it? 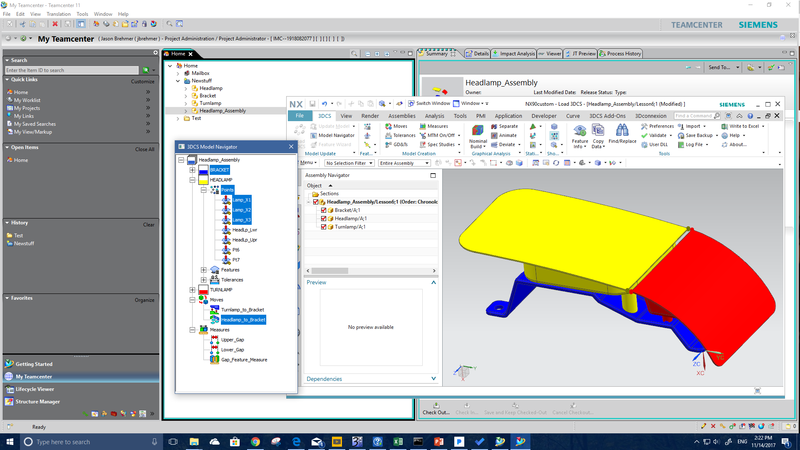 3DCS Variation Analyst for NX is an integrated software solution integrated into Siemens NX CAD that simulates product assembly and part tolerance 3D stack-ups through Monte Carlo Analysis and High-Low-Mean (Sensitivity) Analysis. 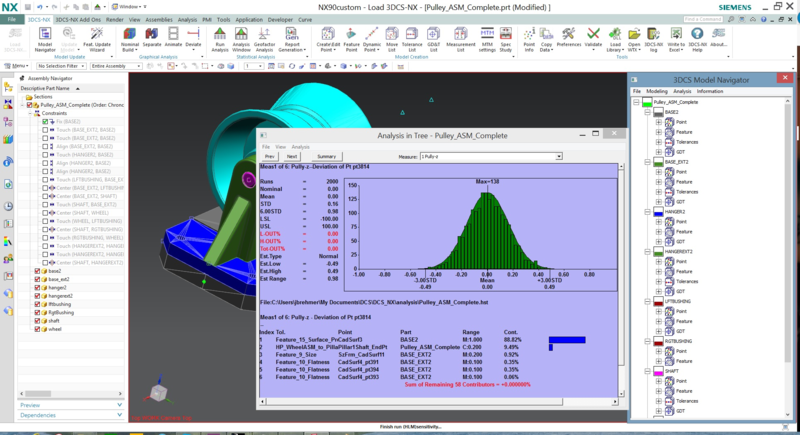 3DCS for NX gives outputs based on part and process variation. These can be input in a variety of ways, from CAD based PMI to selecting from applicable feature or point based options in 3DCS. The final results are shown as statistical (Monte Carlo) and mathematics (GeoFactor) based outputs with toggle-able metrics like Cpk, Ppk, ranges, percent out of specification and a variety more. What helps 3DCS for NX stand out is its connection to Siemen's Teamcenter PLM system. 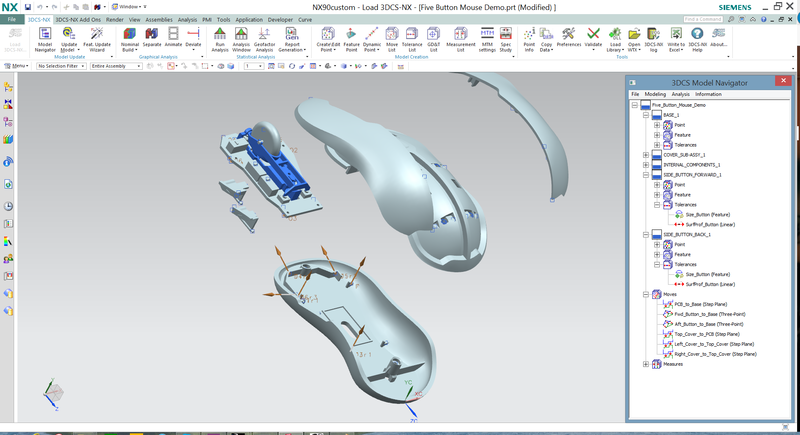 Not only is 3DCS for NX integrated into NX CAD, but it in turn is integrated with Teamcenter. The 3DCS analysis data is stored in the NX CAD model, meaning that any place the model is stored or managed takes the 3DCS data along with it. This makes it easy to store your model and 3DCS data in Teamcenter, handling both version control and data security. Model Part and Process Variation - How does it work? These analyses together highlight the sources of variation as well as potential build issues in the product. By accurately modeling the build process, users can determine how their process will affect the assembly in addition to their part tolerance stack-up. This together creates a virtual prototype that can be used to make decisions about design changes and tooling while reducing scrap and rework. It is no mystery that the sooner a build issue is found, the cheaper it is to fix. When a product is only a digital prototype, an engineering change can be as simple as a click of a mouse. Once the product gets into the customers' hands though, a simple engineering change may mean recalls and warranty claims. The cost difference is alarming. Digitally simulating products and their assemble has become an important part in many OEM's process. It gives engineers the opportunity to validate their assembly process and tolerances early in the Product Lifecycle, and can make relevant, inexpensive changes before tools are cut. Simulation, optimization and validation in the digital environment has been proven to save millions of dollars in production costs, and this number only grows as both the tools and the users become more advanced. As CAD technology continues to advance to include greater levels of analysis, our open API strategy allows us to support the incorporation of tools like 3DCS software to keep up with the growing demands of customers. The partnership between Siemens and DCS will allow an integrated environment, giving NX users access to advanced analysis as part of the CAD environment. What does 3DCS for NX offer your company? 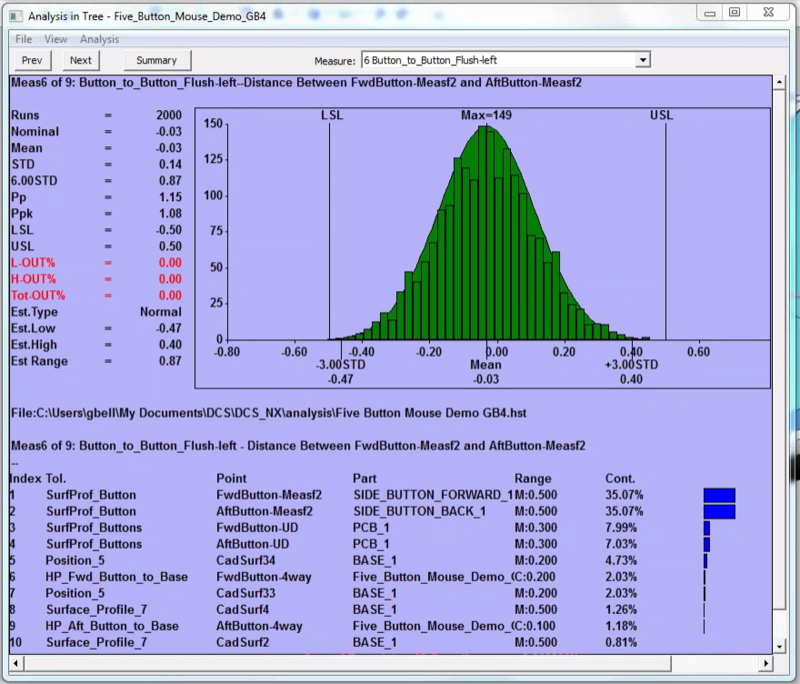 3DCS for NX pulls in NX PMI data to quickly tolerance your Variation Analysis models. This is a fast and effective way to begin your anlysis, but also gives engineers the ability to validate the GD&T (PMI), and optimize it to improve product quality, by tightening and testing areas critical to build quality, as well as reduce manufacturing costs, by increasing (loosening) tolerances in non-critical areas. Use visualization tools like VRED from Autodesk, or NX's built in Ray Traced Studio to create photo-realistic images of your model. Apply tolerances and gap and flush conditions to see how your product will look at the extremes, then set maximum and minimum specifications for engineering to hold to in order to guarantee your product's Perceived Quality. View the effects of Stack Ups and different conditions on your product to understand how variation will affect its appearance. Utilize this with engineering's analyses to understand how these same stack ups will affect the products performance. Together, design better looking and functioning products at lower cost with a faster time to market! 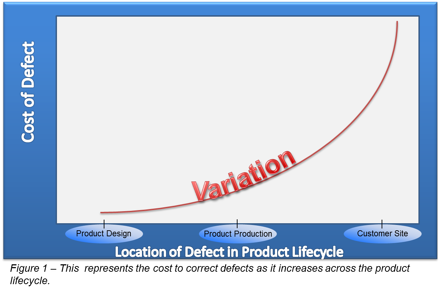 Use 3DCS software to hone in on the source of variation, and then use iterative design changes to optimize your product for manufacture and assembly (DFMA - Design for Manufacture and Assembly). 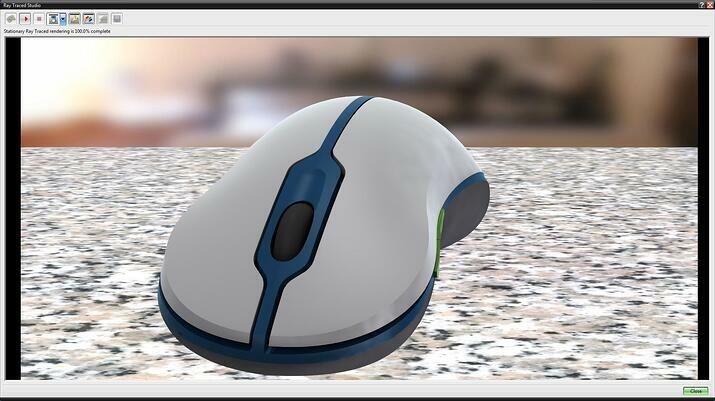 Making changes to the design based on your simulation results, the answers become a button push away. Change the design in NX, adjust tolerances, change assembly processes, and quickly see the results. Compare and contrast different build strategies, locators, datum plans, tolerances and other inputs to see how they affect your final product. Create the reports you need from 3DCS with the push of a button: html, pdf, PowerPoint ppt or Excel. Use the reports to share information with colleagues, present on progress and your modeling strategy, to archive the model's information and inputs, or to summarize the results for managers and customers. These reports are powerful tools for business as well. Used to generate coordinated measurement plans, they can be used to standardize measurement procedures and CMM routines for suppliers and OEM's. Use your reports instead to negotiate tolerances with your customers, whether they are suppliers, or OEM's, showcasing why tolerances need, or can be, loosened or tightened. All of this without having to spend hours and days compiling images and data. With the push of a button, you have all the information you need. Customization options let you configure your outputs to meet each need, letting you create a variety of reports and outputs from a single model.